"Impossible Water" "How is this possible. Water can float?" If you hate capitalism and believe that America and Japan are oppressing the proletariat, don't read "How tree-Hugging hippies are destroying our environment." The author has a sense of humor, too. "Here is a true story someone found regarding exams at Cambridge University. It seems that during an examination one day a bright young student popped up and asked the proctor to bring him Cakes and Ale. The following dialog ensued:"
A few centuries from now, America may enjoy the occasional chuckle from situations like this: except then it will probably involve cell phones and photo ID. "Google fitted with (temporary) Digg implant" - except that, in Google Labs's experiment, your 'diggs' only affect you.
" Crazy Paper Cylinder ! How To Make !" - less than two minutes of video. Between the time-lapse video and complexity of this gizmo, you'll probably need several run-throughs before trying to make your own. "Bad Day on the Dock!" "They say every picture tells a story. After studying the first picture, can you determine what's up?" If things aren't going well for you today, this series of photos will show that you're not alone. "Enchanted Earth Washable Textile Art Garden - Necklaces"
These necklaces all look very organic. I think that they'd look better displayed on a wall, than around someone's neck, but that's one opinion. The one called "autumn leaf" looks more like a live nautilus to me.
" The force is strong with this one...."
Watch a sketch of a famous Star Wars scene get drawn. "These are things people actually said in court, word for word, taken down and now published by court reporters who had the torment of staying calm while these exchanges were actually taking place." Slightly "PG," also very, very funny. "Kitty training ground Kitty honing its skills on a frozen pond." Chasing fish on the other side of the ice: a video. "The Myths and History of Red Hair"
Red hair is unusual. And, as so often happens with the unusual, people through the ages have gotten unusual ideas about what red hair means. "Dio Cassius described British warrior-queen Boudicca, as being 'tall and terrifying in appearance' and as having a 'great mass of red hair.'" Here's an Idea: 86 "www"
"No More 'www' " - this short article doesn't sound like the work of a crackpot. The idea is to drop the "www" prefix, not abolish the web. ("86?" That means to get rid of, dispose of, eliminate, and a few more things. look it up, or, better yet, Google it. "Paper art - Amazing" - what the title says. Photos. Impressive: very. "A Big List of Sites That Teach You How To Do Stuff" - with short descriptions. "Dubai Wonders" shows what can be done with a huge budget, and a willingness to build something new and different. Photos, renderings, almost no text. Knowing quite a bit about what's been getting built, and planned, in Dubai helps when viewing this page. These photos of news and moderately weird buildings show that architects aren't running out if ideas. At least, I think that's what they show. Another thing: buildings that lean seem to be in this year. "Sketches of Japanese Manners and Customs"
A complete nineteenth century book about Japanese "manners and customs," illustrated, in pretty-high-resolution photographic reproduction. Really funny spoofs of London Underground announcements - but please, do Emma Clarke a favor, and wait a few days before following these links. Emma Clarke's voice is familiar to people on the London Underground. She's a voiceover artist who, among other things, did those announcements like "mind the gap." Then she recorded some spoofs of her own announcements, and put them on her website. They're funny, by the way. A newspaper interviewed her, and decided that she didn't like a particular part of the Underground. When that hit the fan, she explained to another paper, "The Times" (UK), "I did not say that the Northern Line was dreadful. I did say it’s a challenging line. What I did say was dreadful was the thought of being in a Tube train listening to my own voice." My guess is that the Tube bosses decided that she had besmirched the fair reputation of their tunnels. That would explain why they decided not to use her services any more. "Hi - thanks for stopping by. Unfortunately, my site is currently overwhelmed by the sheer number of people wanting to download MP3s of my spoof Tube announcements. Please check back in a day or so." Until Emma's website is back online, here are transcripts of some of those spoof announcements, taken without permission - and with no guarantee made or implied of their accuracy. "Would the passenger in the red shirt pretending to read a paper, but who is actually staring at that woman’s chest please stop. You’re not fooling anyone, you filthy pervert"
"Passengers are asked not to drop litter on the train. Please use the tramps provided"
"Would the passenger in the pinstripe suit and thousand-Pound glasses who obviously works in the media please take one step forward on to the track"
"Passengers are reminded a smile is a friendship signal, not a sign of weakness"
"Would passengers filling in their Sudoku, please accept that they are just crosswords for the unimaginative and are not more impressive because they contain numbers"
"Residents of London are reminded that there are other places in Britain outside your stinking city and, if you remove your heads from your backsides for just a couple of minutes, you may realize the M25 is not the edge of the Earth"
"We would like to remind our American tourist friends that you are almost certainly talking too loudly"
"Historical Census Browser" Isn't for everyone. But, if you get an overwhelming urge to study parts of the U.S. Census, back to 1790, this site is for you. "Top 7 Weirdest Houses," with photos and text. There may be weirder houses, but not by much. "The Glass House" by Philip Johnson makes the list. I see the author's point. That architectural oddity is beautiful, but ... well, take a look for yourself. Not on the list is a house which I hope to find online someday. It was designed by an architect as a one-of-a-kind gift to his mother-in-law. Constructed of conventional planking, the house is a rectangular prism, resting on one edge, the four 'middle' corners supported by wooden pillars. A chimney is encased entirely in wood, and the door is in one of the sloping sides. The house drew a little attention a few decades ago, as an architectural curiosity. Being from an agricultural area, I recognized the shape almost immediately. It's a scaled-up replica of a commonly-used sort of fertilizer bin. "Most expensive homes in Europe" Photos and statistics. A reminder that there are people who could buy and sell Paris Hilton: and have the good taste not to. "Artistic images of Alexander Kruglov" is a set of 13 images that put me in mine of surrealistic art. From a technical point of view, Kruglov seems to be quite good. Aesthetically, I'll let you decide. I like them, but probably wouldn't buy them. "5 Best Things to Say When Caught Sleeping at Your Desk:" from Atlanta Illustrated. I don't necessarily endorse a practical application of this list: but it is funny. This could be a good resource for amateur astronomers.
" Rocket Booster Fuel Dump - 11 Nov. 2007" shows what happens when a spacecraft dumps fuel between an astronomer and a nebula. Amateur astronomers may appreciate some of the technical details the poster mentions. Most people may enjoy this cool photo. Speaking of astronomers, amateur and otherwise: If you can identify this nebula, please leave a comment. Thanks! "Squirrels Obstacle Course" - someone spent time and thought, designing obstacle courses for squirrels. We're shown one particularly complicated one. Also, video of a squirrel that's discovered the treasures in a vending machine. "Comments made in the year 1955:"
It starts with "I'll tell you one thing, if things keep going the way they are, it's going to be impossible to buy a week's groceries for $20." I think my favorite is "I never thought I'd see the day all our kitchen appliances would be electric. They are even making electric typewriters now." The author has some pretty good period pictures, too. More weird paintings by Jeff Soto. He's got an imagination, I'll say that. "California Ice Age (Detail image) by Jeff Soto"
This painting looks: very strange. Enjoy. The statues are amazing, all right, but there isn't any descriptive text. I'd like to know what city these are in. Or is it cities? What is it with posting photos, but no text to tell people what they're looking at?! Oh,well, wherever these are, and whoever created them, these statues are genuinely imaginative - and amazing. This post starts with "ignore the naughty words..... it's too good not to share." I don't know where this story started. By now it's spreading across the Web. If you know where the original of this story appeared, please leave a comment with the information. I could start discussing intellectual property rights, but it's getting late. Enjoy! Or, What's Wrong with "Said?" "The Use and Abuse of Dialogue Tags"
Good discussion of how not to look silly, trying to avoid saying "said." "JimJamZoo / Art, Fun and Useful things you might have never seen before. Hanging Temple"
Actually, the temple doesn't hang: it perches on a cliff. There's no descriptive text. Judging from the architectural style, I'd say the temple is in east Asia. Probably China, but I'm no expert. "The Day Before..." is what this page is called. Four photos, from the day before September 11, 2007, August 6, 1945, and two other memorable dates. You'll appreciate this more, if you know a little history. "Vandals strike 6 more high-speed data sites in the Twin Cities"
The damage has been minimal, this time. "In the span of four days last week, vandals knocked out landline and wireless phone and data service to thousands in St. Paul and Minneapolis." On the other hand, a small bunch of thugs disrupted the flow of information in part of a small city without too much trouble. That's a concern for anyone who uses the telephone - or the Internet. "The Journal of Irreproducible Results"
"Top-50 Websites - Ranked by Unique Visitors; Digg.com, Facebook, Flickr sky rocketing"
Some of them are more palaces than castles, but the "breathtaking" part is fairly accurate. This is a nice selection of photos. No descriptive text, though, as far as I could tell. "Meet Lil'Bit - the cat with two faces" tells about a kitten, now seven months old, and a determined owner. There's an information technology angle to this story, too. Lil'Bit was born under a computer table, and, more to the point, the story of this Arizona cat and his owner is in a British paper, the Daily Mail. I'm old enough to remember Telstar, and when the wirephoto was about as good as it got for transmitting photos. We've come a long way, for a British paper to be carrying a story about a cat born in "Arizona, USA" - with color photos. One thing I like about astronomy is the way it puts things like international affairs and grocery lists in perspective. Many a planet by many a sun may roll with the dust of a vanish'd race. "Don't Click Here: The Art of Hyperlinking"
A history of the hyperlink, which may be interesting, and some pretty good advice, which will probably be useful. "Hi there…I’m poison oak!," a helpful, and funny, sign. "First high-resolution 3D image of a complete cell" - from March of 2007. This was a joint project, by the European Molecular Biology Laboratory and the University of Colorado. There's a (2D) picture with this post. "Robots Get So Small They Can Fit in Arteries"
These artery-clearing nanorobots are being designed at South Korea's Chonnam National University. Their power supply supply is sugar in the patient's blood stream. "The number one reason you find it difficult to write"
The bottom line of this post is "Write how you talk." The author says that most people write more formally, even pompously, than they talk. As a recovering English teacher, I can confirm that. A good read for people who write. "Comet Holmes Bigger Than The Sun"
It's supposed to have been a naked-eye object, in the northwestern sky. Between weather and schedules, I haven't had a chance to take a look. "Modern Interior," "Wave Shelving," and more pictures of architectural scenes that I think might be more fun to look at, than live in. This photo, "Writers Guild On Strike," was probably altered: but it's funny. "Things People Said: Words Without Thought"
"'Where do you think water comes from? The SKY?' -- From an overheard argument about water conservation." "'We might be late because of bad weather. If we are, would you hold the ship until we get there?' -- A man on the phone with a ferry service." "'Desktop Model has INCLUDED a FREE 3 Year On-Sight Warranty' -- An advertisement for a computer." Related posts: "Cluelessness and the Park Ranger"
"Customer Service: Tech Support Frustration isn't all on One Side"
"The Untold Story: How One Small Disc Carried One Giant Message for Mankind" tells about a silicone disk (about 1 1/2 inches across, or roughly 4 centimeters, or roughly the size of an American dollar coin), left by the Apollo 11 crew at Tranquility Base, and now nearly forgotten. There's more detail at collectgSPACE.com. For me, the disk itself isn't particularly interesting, apart from the technology and art involved in making it: it's the messages on the disk. Today's Zits, "Glossary of Grunts," is close to a must-read for parents of teenagers - particularly if you've had a rough day. Enjoy. "Legend: Questions that people have allegedly asked of Park Rangers around the country." Some of the questions on this Snopes.com page are daft enough to be true. "World's most effective speed bump" is, I'm quite sure, an example of how special effects films are no longer a movie industry monopoly. The video is short and and funny. And, today's judicial systems being what they are, I'll add - kids, don't try this at home! The conversation transcripts read like a blooper reel of tech support calls. "Customer: I have a huge problem. A friend has placed a screensaver on my computer, but every time I move the mouse, it disappears !" (1) About "Boleh mati wor:" the phrase may be Maylay for "I could die laughing." Or, in could mean something entirely different. Two of the three words show up in "Dr Bhanot's Malay-English Cyber-Dictionary," and two words there, ketawa and tawa, have mean "laugh" (and "laughter," for ketawa) - so "wor" just might have something to do with the "...awa" part of those words. If I'm wrong, and you understand Malay, please treat my attempt at understanding with maaf. "This way to the Crazy Lady" I like cats myself, so I know that not everyone with cats is a few scoops short of a full litter box. And, I think the cartoon is funny. "A "Psychological" Optical Illusion:" "The influence of culture and environment can have an effect on our visual perception. This theory was first explored by Robert Laws, a Scottish missionary working in Malawi, Africa, during the late 1800's." Very interesting. I strongly suggest that you take a good look, and decide what you're looking at, before reading the text below the picture. "Hit Scrapers Where It Hurts: AdSense" gives a sensible, practical, way of dealing with people who steal your online content. The author even gives a step-by-step how-2 for how you report content thieves to Google's Adsense. Since the crooks are almost certainly out to make money from your work, cutting off their supply of cash should be an effective way of dealing with them. "Flash Physics Engine Box2DFlashAS3 1.4.2" is a two-dimensional physics simulator: Have fun, moving the objects. You can even toss them. "Cybermaze Photo Gallery: Architecture" - a sort of slide show of architecture. Surprisingly enjoyable: I spent a couple of minutes going through it. Maybe not, but this television ad is good! I'm not sure if it's rap, but the vocal style is similar. It's entertaining, and you're not likely to forget the name of the place, and what they sell. Certainly not if you hear and see it more than once, and live in the store's area. "Stuart Haygarth's Found Object Chandeliers"
As a rule, I'm not impressed with "artists" who dumpster-dive, glue what they find together, and sell the result to someone with a suitable good-sense/disposable-income ratio. That's not true. I am impressed with their abilities as salespeople: but not as artists. Haygarth seems to be an exception. "Tide Chandelier (sold out), for example, is composed of man-made debris that washed up on a specific stretch of Kent (England) coastline and that Haygarth had been collecting for years." If I hadn't seen the photo, I would have expected the result to look like what some eccentrically artistic Englishman pieced together from debris he found on the Kent shore. It does, of course: but the result is attractive. I think it helped, that he cleaned the pieces. "Active and Passive Voice" is a pretty good review handout. This page is part of Purdue University's "Printer-Friendly Handouts for Grammar, Punctuation, and Spelling." Okay, you learned all this stuff in school. But, review doesn't hurt. Besides, these thing could make a good reference resource, like the style manual I keep by the other computer. "Numbers' & Numeral systems' history and curiosities"
The blog is still there. It's now called "The Weather Front". "Janice Dean the Weather Machine"
"She asked me what she should say about the Blog - and I told her fun stories about weather, lots of pictures, funny stuff and dancing. That about covers it right? (Oh, and of course wonderful visitors and commentators!" Santa Clause and H* H* H*! Don't laugh, too much. This is for real. "Santa Claus outraged by 'ho ho ho' ban"
I hope I wasn't being derogatory to women, or frightening to children, by using the h-word. "Don't Forget to Back Up Your Brain"
"As any Baby Boomer will tell you, Americans have more information to cram into their memories than ever. Yet, as we age, our capacity for recall grows weaker. "But what if you could capture every waking moment of your entire life, store it on your computer and then recall digital snapshots of everything you've seen and heard with just a quick search? "Renowned computer scientist Gordon Bell, head of Microsoft's Media Presence Research Group and founder of the Computer History Museum in Silicon Valley, thinks he might be able to do just that. "He calls it a 'surrogate memory,' and what he considers an early version of it even has an official name — MyLifeBits.v 'The goal is to live as much of life as possible versus spending time maintaining our memory system,' Bell explains...."
discusses next-generation technologies that may be the biggest thing since writing. Sort of reminds me of "Ghost in the Shell." Label Clouds: One Way to Do It. "phydeaux3: Setup and configuration for New Blogger Tag Cloud / Label Cloud"
This is where I got the label could code for this blog, and others. It's fairly flexible, and produces results that I like. I don't mind (constructive) feedback on how well the cloud does (or doesn't) work for you. (What's "constructive criticism?" Here's an example: "It stinks" doesn't give me much to work with. "It stinks because I can't read the smallest labels" is something I can change. The second comment was constructive criticism. "Readability Test" (Juicy Studio) briefly discusses reading level algorithms. I've no idea how accurate this is: It may rank a bit on the high side. However, it's fun: and might be a good diagnostic tool (if anyone can dig up what algorithm the test uses). I heard about this through a BlogCatalog discussion thread, "What's your blogs reading level?." "Illy Cafe in Push Button House"
Folded, it's a cargo container. Unfolded, it's a cafe. Another version becomes a house. Wave of the future, or fun gimmick: you decide. "Project7ten, The Real Green Deal" "Actually, it's ready for sale if: (1) it hasn't already been sold, and (2) you're in the market for one of the greenest, most modern homes in California." "For My Writer Friends…" "My husband Stumbled me this comic. This is for all my writer friends out there!" Be sure to read titles on the bookshelf. "We've all gotten the call from some family member asking why their computer isn't working properly. After an hour...."
You Think You Had a Bad Day?! 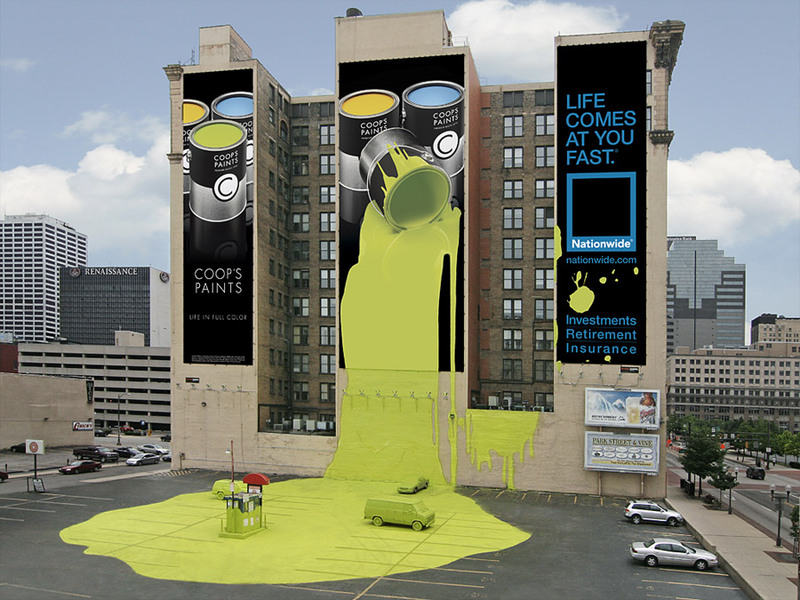 "coopswall.jpg" May be a really good piece of digital graphic work: but I suspect that it's real. There's more at "::: I believe in advertising :::." Monitor Cleaner won't do your monitor any good, but it could give your diaphragm a little workout. Providing that you've got Flash on your computer. "Wisconsin Cop Accidentally Tases Self" recounts why a mercifully-anonymous Madison cop has a sore hand, and a letter of reprimand. "Josh" targeted Megan, a thirteen-year-old girl, making her think that he was a true friend - and boyfriend. On a MySpace account, it's not hard to be anyone you want to be. In the real world, Megan was thirteen, overweight (but working on that), had ADD, and had problems with depression. Then, "Josh Evans" told Megan Meier "I don’t know if I want to be friends with you anymore because I’ve heard that you are not very nice to your friends." Things went downhill from there. "Josh" doesn't exist. He's a MySpace account created by the parents of a girl Megan knew. These alleged grown-ups decided to teach Megan a lesson, because their daughter and Megan weren't friends any more. So, they created "Josh," and used him to torment Megan until Megan killed herself. I'm skipping the usual "alleged" stuff here, because the police told Megan's parents that there would be no charges in the case, since no law was broken. Assuming that hounding a teenage girl until she kills herself is legal, as long as you do it online, we've got a serious problem. Lawmakers have one of those paroxysms of legislative passion, and create a techno-illiterate, draconian, zero-tolerance/zero-sense piece of legislation that will keep courts and lawyers employed for decades. Until that distant day comes, when people in leadership positions have a clue about email, the Web, and other information technology(1), we're on our own. I think that includes letting our kids know that people they meet online may not be as-advertised. Don't be surprised if you don't make a connection: Their servers seem busy this morning. (1) People get into high-level executive positions, in business and government, in their fifties (forties, for over-achievers). So, my guess is that it will be thirty or forty years before we have leaders who understand the Internet as well as today's leaders understand the telephone. "Prismatic Spring" (Jan Parker 2006) is a good-quality photo of a hot spring. Be prepared to wait for the download to finish. This is a large picture (4800 x 1200 pixels, 4905.05 KB). Hey! Here's a (modern?) house, in Minnesota: My state. As for the "Hive Modular:" That's a modular home company. I'm not sure that I'd have chosen that name for the company. "Kochi Architects" - check out the second photograph. Even by standards set in the latter half of the 20th century, that's one strange-looking building. "Museum of Fruit" looks very much like a fruit basket. "Floating Crystal Ball Trick Video" "This guy has a really cool talent, he can make a crystal ball look like its floating effortlessly. The last 10 seconds are amazing." I think this is juggling, although the ball never leaves his hands, arms, or whatever. "Honor Flights Say 'Thank You' to Vets" at military.com. "Sauk Centre this Season / Armistice Day" on my flagship website, brendans-island.com. "Scenario: Jack goes quail hunting before school, pulls into school parking lot with shotgun in gun rack. 1967 - Vice principal comes over to look at Jack’s shotgun. He goes to his car and gets his shotgun to show Jack. 2007 - School goes into lock down, and FBI is called. Jack is hauled off to jail and never sees his truck or gun again. Counselors called in for traumatized students and teachers." There's a lesson here, I think. "Space Shuttle Processing," a sort of photo-essay of how the space shuttle is assembled and launched. Imaginative (very) short science fiction story about two aliens and their encounter with a very strange race. "Fiction Writer's Character Chart" is yet another character-creation aid. Using it won't make you a writer, but it's worth looking at, if you're trying to write fiction. "Security Pro Admits to Hijacking PCs for Profit:" news item about a major hacker, who's been caught. "What Really Happened at the X-Wing Launch - Video:" "Caught on video: what really caused the X-Wing fighter to disintegrate in mid-air. This Tie Fighter came out of nowhere to shoot it down." Fun, with not-bad special effects. One error, I think: The flying X-Wing was 21 feet long. I doubt that was "Life size," as it says in the video title. "Stacy Dynan Paintings" are, for the most part, abstract landscapes. Don't let that description fool you: People who aren't trying to be sophisticated might want one on their wall. "New Yorker Cartoon by Matthew Diffee" - "Captionless (A building marked, “Kingdom Hall of Jehovah’s Witnesses” has a “No Soliciting” sign in front.)" This one is, for me, a knee-slapper. I wouldn't suggest reading "birds are gross immediately before or after a meal, but I think this cartoon is funny. That turkey vulture has no problems with self-esteem. The Big Questions is: Why Would a Raccoon Steal a Door Mat? "Raccoon steals door mat" is a video, about a minute long, of a raccoon stealing a door mat. What puzzles me is: Why would a raccoon want a door mat? "HubbleSite - Tonight's Sky - November" is a cool multimedia guide (movie, really) showing November sky highlights (northern hemisphere). You don't need much astronomical know-how to enjoy this, but a moderately powerful computer helps. "How much is a Million? How much is a Trillion?" "A million seconds is 13 days. A trillion seconds is 31,688 years." "Sun's Wayward Twin Discovered" is a slightly deceptive title, since the fourth addition to the just-about-like-our-sun list doesn't seem to be physically related to the star Earth orbits around. However, HIP 56948 is a very, very, close match to our sun: and not all that far away: 200 light years, in the constellation Draco. It's not exactly next door, either, but since the galaxy we're in is upwards of 70,000 light years across, 200 light years isn't all that great a distance. "corner building" is an impressive photo of a building: that bears a striking resemblance to the "Flatiron" building New York City. At least three commenters noticed the resemblance. "9 creative staircases" (Deputy Dog (November 5, 2007)) may be an understatement. There's a photo of each. "Richard Amsel (1947 - 1985)"
Hired to do the first film poster work (Hello Dolly). You'll recognize quite a bit of his work. "Planet System Similar to Ours Revealed." 55 Cancri, a star about 41 light years away, in the constellation Cancer, has five planets. The fifth was discovered recently, and is around the right distance from its star for water to be a liquid. Since the fifth planet is about 45 times more massive than Earth, and possibly built along the lines of Saturn, there won't be life-as-we-know-it on the planet. But, that doesn't rule out moons of the newly discovered planet. And, there's a gap in the five known planets' orbits that's within 55 Cancri's habitable zone. And, there's "Newfound Planets are Scorching Hot." They each orbit a different star. Two are about 500 light years away, in the southern constellation Phoenix (appropriate name, in these circumstances). A short bit of video. My family had a cat who was clumsy, too. Enjoy. 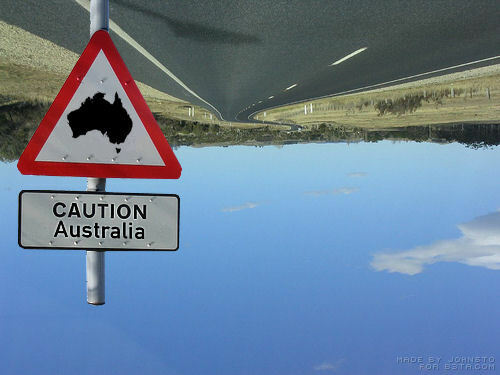 "CAUTION Australia" is almost certainly the result of photo manipulation, but it's funny. These days, I can't tell when someone is making an over-the-top joke, and when the joke is supposed to be taken seriously. For example, that one tribe that's forcing the University of North Dakota to drop their team name, "The Fighting Sioux." Say, I'm half Norwegian! Maybe I should round a few people named Sven and Leena, and insist that the Minnesota Vikings is demeaning our proud heritage. Do you realize that those guys don't even use swords?! Back to Columbus, who also stole credit from the Vikings (the real ones) for reaching the Americas first: I think the poster's funny. By the way, the Vikings stole credit from an Irish monk named Brendan (I'm almost half Irish). And all of those Europeans were shut out by another part of the family, about 20,000 years ago. Things get complicated, when you start trying to be inclusive. * there's more to the caption. "SYNONYMS FOR WORDS COMMONLY USED IN STUDENT'S WRITINGS" is a moderately edifying compilation of synonyms. And, I think that should be "students'" in the title - since I suspect that this post was supposed to apply to students in general, not just one. Still, it's a good vocabulary refresher. Enjoy!
" Twin girl with eight limbs to have surgery"
Lakshmi Tatma, a two-year-old with a parasitic twin, survived surgery. From what I've read about the procedures she'll be subjected to, she won't be a happy camper for quite a while. On the other hand, this is being done to straighten her out, literally, and make it more likely that she'll survive past adolescence. My family's prayers are with her and her family. "Modern architecture photo gallery - Los Angeles"
Links to photos "modern" buildings, by decade of construction, 1900 - 2000. Names of freeware utilities, in alphabetical order, with brief reviews. Looks promising. X-ray Cartoon: Light Humor or Penetrating Insight? This cartoon's caption reads "Your x-ray showed a broken rib, but we fixed it with Photoshop." Funny! Providing you haven't had a similar experience. "How to hug a baby." A 5-step how-2 for dogs. Each step has a illustrative photo. Stop Global Warming: Upgrade Trees? "Nature's Cruellest Joke" isn't for people with emotional attachments to global warming: but I think it's funny. "Pumpkin Gutter" is updated once a year, around Halloween. If you didn't see enough exquisitely carved Jack o' lanterns this year, this is a site for you. "Pumpkin Gutter" is where Scott Cummins showcases his pumpkin sculptures. Last year, he carved 33: Jack o' lanterns? "Touch Found to Be Key in Making Robots Human-Friendly"
QRIO (pronounced "curio") giggles when touched - and that seems to make a difference. "House is in Lubbock, Texas" - a very futuristic, very cool-looking house. 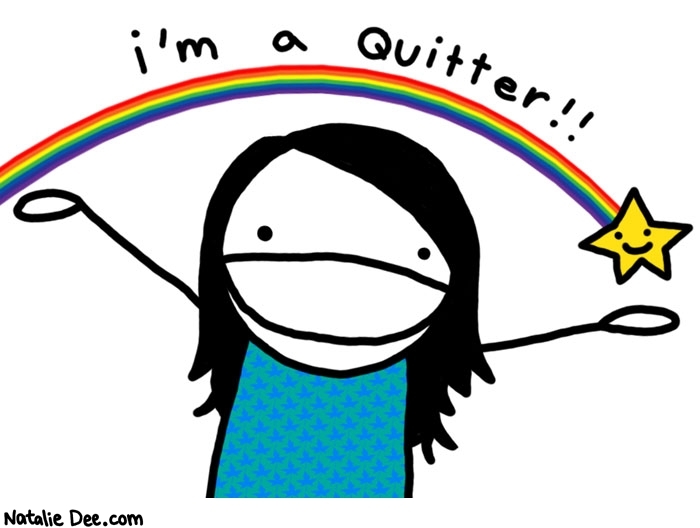 "Move On / Know When to Quit." I sincerely hope that these emergency responders realize that you can do things to a practice dummy that you can't do to a human being: more than once. I can't condone item #3, but I think you'll agree that this is a realistic to-do list. "Little Known 'Boring' Websites That Make Incredible Money With AdSense." I'm not sure I believe this article, but it's an interesting claim. Being within rock-throwing distance of being a "gray Googler" myself, I may be see if there's anything behind the claims. "Private Art:" A Collection of WWII Letters To and From The Home Front. Private Arthur "Art" Primer was a "boy, raised in a religious family whose devout mother saw to it that he attended Sunday Mass and the sacraments." Japan attacked Pearl Harbor when he was 16. By 1943, he was another GI in the 86th Chemical Mortar Battalion. Here's an excerpt from one of Private Art's letters home: "P.S. I'm sending the good conduct medal home. It's not doing me any good over here." "Elaborate prank leaves Oregon officers in custody of gnomes." The seattlepi.com headline isn't quite accurate. But, at least one police captain is now sharing his computer with a gnome. I'm taking the weekend off, as far as blog entries are concerned. And, I'll be reconsidering how I handle this blog. See you next week! Someone's list of "Awesome programs," from 7-zip to XPize. "B-25 Empire State Building Collision" at Aerospaceweb.org may be the best, most complete, discussion of the WWII disaster. "Plagiarism in the Digital Age" tells about one man's encounter with online plagiarism. I don't agree with the author's reaction: "The other, and more depressing, lesson is that the Internet has rendered the concept of copyright virtually meaningless." Still, this is a pretty good look at some of the effects of plagiarism. "Cute little animals." 39 photos. I've seen one or two before: but most are new to me. and vintage comics. (Pg 1)" - first of seven pages of thumbnails. "Journey of Mankind / The Peopling of the World." A flash interactive timeline, showing 160,000 years of migrations, starting in east Africa: a story that's gotten more detailed, now that mtDNA and other investigative tools are available. It's not the smooth progression that I learned about, back when. About 90,000 years ago, for example, a "global freeze-up" sealed the doom of people who had moved into the Levant and north Africa. The eruption of Mt. Toba, about 74,000 years back, was worse: six years of "nuclear winter," followed by a thousand-year mini-ice age nearly killed us off. "RuneScape" - the massive online adventure game by Jagex Ltd. offers Role Playing Game players virtual 'career opportunities.' As well as the conventional hack-and-slash, players can have their characters learn to fish, cook, chop wood, and several other skills. There's a free area, intended to whet your appetite to the point where you pay for more. RuneScape is fun: and I recommend that you set an alarm clock before you start playing. "Top 30 Technology Predictions that were Wrong:"
Some are familiar, like Lord Kelvin's "X-rays will prove to be a hoax." Others are not so familiar, like Alex Lewyt's "Nuclear-powered vacuum cleaners will probably be a reality in 10 years." Where'd That Email Come From? "How to track the original location of an email via its IP address" - from Online Tech Tips. This isn't for everyone. The techniques work for GMail, Yahoo Mail, and Outlook. You could try applying the principles to other services, though. "How to Write Good" is a 31-point list that includes gems like "One-word sentences? Eliminate." and "Analogies in writing are like feathers on a snake." Fun for anyone who has read how-to-write advice, and a pretty good example of how (sometimes) rules are made to be broken. Prestidigitation With Crystal Ball? Or Juggling? Star Wars X-Wing Crash: The Truth Revealed!!! !